British comedy Eaten By Lions has won the top prize at the 9th Bagri Foundation London Indian Film Festival in London, Birmingham and Manchester, the UK and Europe’s largest platform of independent cinema from the Indian subcontinent. The festival is title sponsored by the Bagri Foundation who share our passion for Asian arts and culture, with major support from Grange Hotels, Integrity International Trust and Sun Mark Ltd, and is funded by grant support from the BFI’s National Lottery Audience Fund. 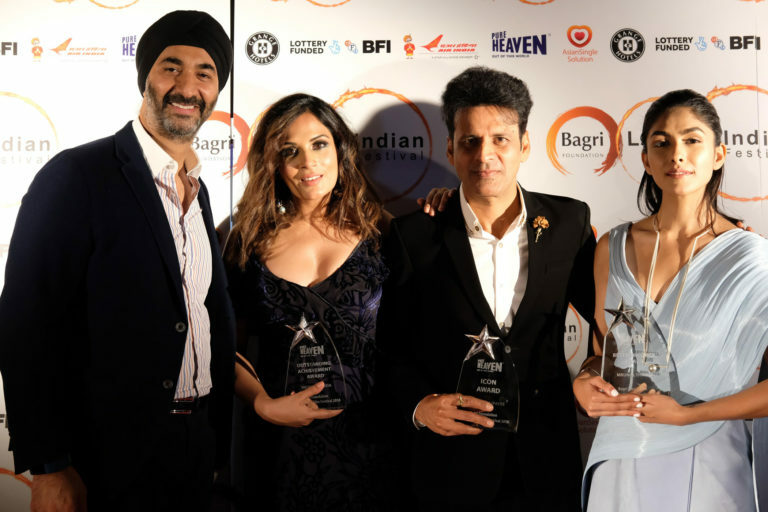 Other special awards presented by the festival included two Sunmark Ltd Pure Heaven ICON Awards, which went to 2 acclaimed actors from India, Irrfan Khan and Manoj Bajpayee. ICON awardee Irrfan Khan (Slumdog Millionaire, The Lunchbox and Life of Pi) who presented a masterclass at the British Film Institute at the festival in 2013, reuniting on stage with BAFTA and Academy award winner Asif Kapadia, who directed him in The Warrior, accepted his ICON award privately, while undergoing major medical treatment in London. 2 of his films showed at the festival this year, Mostafa Sarwar Farooki’s Doob – no bed of roses, and Anup Singh’s Song of Scorpions. Falling into pride month, the well appreciated LGBTQ+ films at the festival, were a strong celebration, including 2 films with a transgender theme, told with the female gaze; Sangeeta Datta’s Bird Of Dusk and closing night film at BFI Southbank, Eisha Marjara’s Venus, plus the sold out film from Tamil Nadu, India, My Son Is Gay. Toxic masculinity which explored the relationship of Father’s and Sons, the Female Eye and the Extraordinary Lives of over a Billion people from the Indian subcontinent, were all strands explored and much lauded, at the festival. One of the festival’s most unique screenings was a British Sign Language Q&A after the multiple Indian National award winning film Village Rockstars by Rima Das, which attracted a significant hard of hearing audience. The festival closes in London at the BFI Southbank on 29th June, and concurrently in Birmingham (BIFF) at MAC Birmingham with the Canadian comedy Venus, and in Manchester for the first time, with the rustic village tale Village Rockstars, on July 1st. The BFI is a major supporter of a tour of new Pakistani films this Autumn called Pakistani Film Circus, happening in Manchester, Bradford, Leeds and other UK cities across the North of England.